Rabbit anti Mouse, Rat LYVE-1. Product is tested for Immunocytochemistry/Immunofluorescence, Frozen Sections, Enzyme Immunoassay, Western blot / Immunoblot, Flow Cytometry. Highly pure recombinant Mouse soluble LYVE-1 (Ala24-Gly228) produced in insect cells (Cat.-No DA3524). This recombinant soluble LYVE-1 consists of amino acid 24 (Ala) to 228 (Gly) and is fused to a C-terminal His-tag (6xHis). 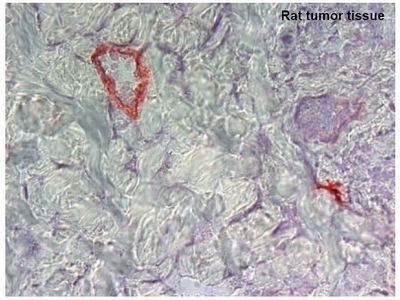 Immunohistochemistry on Frozen Sections (1-5 µg/ml). For formalin-fixed, paraffin-embedded sections use the immunogen affinity purified antibody Cat.-No DP3513P. 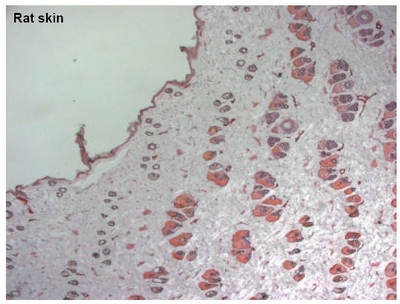 LYVE-1 has been identified as a major receptor for HA (extracellular matrix glycosaminoglycan hyaluronan) on the lymph vessel wall. The deduced amino acid sequence of LYVE-1 predicts a 322-residue type I integral membrane polypeptide 41% similar to the CD44 HA receptor with a 212- esidue extracellular domain containing a single Link module the prototypic HA binding domain of the Link protein superfamily. Like CD44, the LYVE-1 molecule binds both soluble and immobilized HA. However, unlike CD44, the LYVE- molecule colocalizes with HA on the luminal face of the lymph vessel wall and is completely absent from blood vessels. 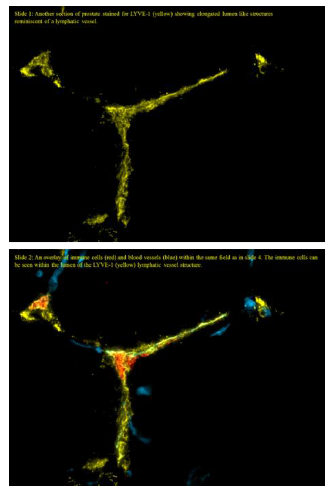 Hence, LYVE-1 is the first lymphspecific HA receptor to be characterized and is a uniquely powerful marker for lymph vessels themselves. Conrad C, Niess H, Huss R, Huber S, von Luettichau I, Nelson PJ, et al. Multipotent mesenchymal stem cells acquire a lymphendothelial phenotype and enhance lymphatic regeneration in vivo. Circulation. 2009 Jan 20;119(2):281-9. doi: 10.1161/CIRCULATIONAHA.108.793208. Epub 2008 Dec 31. PubMed PMID: 19118255. Mouta Carreira C, Nasser SM, di Tomaso E, Padera TP, Boucher Y, Tomarev SI, et al. LYVE-1 is not restricted to the lymph vessels: expression in normal liver blood sinusoids and down-regulation in human liver cancer and cirrhosis. Cancer Res. 2001 Nov 15;61(22):8079-84. PubMed PMID: 11719431. Jackson DG. 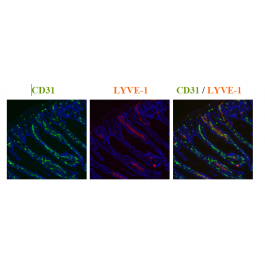 The lymphatics revisited: new perspectives from the hyaluronan receptor LYVE-1. Trends Cardiovasc Med. 2003 Jan;13(1):1-7. PubMed PMID: 12554094. Sleeman JP, Krishnan J, Kirkin V, Baumann P. Markers for the lymphatic endothelium: in search of the holy grail? Microsc Res Tech. 2001 Oct 15;55(2):61-9. PubMed PMID: 11596151. The lyophilized IgG is stable at 2-8°C for one month and at -20°C for longer. When reconstituted the antibody is stable for at least six weeks at 2-8°C. For longer store in aliquots at -20°C. Restore in sterile water/PBS to a concentration of 0.1-1.0 mg/ml. This antibody detetcs Mouse and Rat Lyve-1. 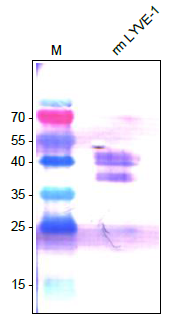 This antibody is not reactive with Human LYVE-1.